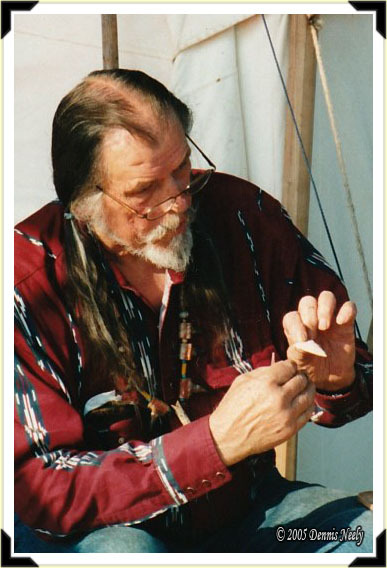 Norm Blaker, a renowned traditional archer and black powder hunter, explains a flint knapping technique to a fellow knapper at the Woods-N-Water News Outdoor Weekend held in Imlay City, Michigan. Norm’s traditional hunting exploits are as spellbinding as those told by 18th-century woodsmen. This entry was posted in Snapshot Saturday, Wilderness Classroom and tagged Dennis Neely, historical trekking, Mountain Man, North West trade gun, Northwest trade gun, trade gun, traditional black powder, traditional black powder hunting, traditional blackpowder, traditional blackpowder hunting, Traditional Woodsman. Bookmark the permalink.